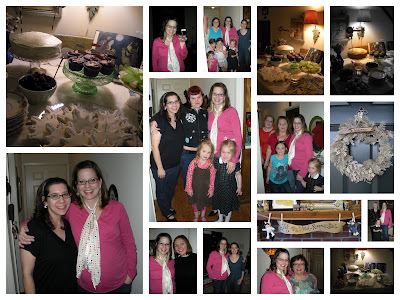 Suzanne's baby shower was lovely (if I do say so myself). I am so happy for Suzanne and her Neil. This will be their first baby boy and I'm sure his big sisters will love him to pieces. Baby Max will be welcomed into his own "Wild Rumpus" and we hope he felt us showering him with love tonight. We love you Baby Max. p.s. Suzanne we love love love love you. I checked your blog tonight just to see if you had put up pictures yet. What a BEAUTIFUL table you set. Everything looks amazing---even Suzanne. What a fun night for everyone---and what a great friend you are for doing that.